Woman cleans mud off a horses front leg. Close up shot. Woman sits on a horse before going on a horse ride. The young woman pats the horse to comfort it. Two horses on hillside on a summer's evening. Birds eye view of black and brown cattle in corrals being sold at live auction, zooming in. Static top down aerial footage of busy cattle auction with hundreds of cattle huddled up in small corrals. Young calves huddled up while being auctioned off before they go to a feedlot to fatten up for beef production. A cattle of cow inside a cage as the cattlemen handles them. The shot pans to the left. 1884 - Moraine Park, Horseshoe Park, the Kawuneeche Valley and market hunters, water developers, cattlemen and a sawmill are shown in Rocky Mountain National Park in Colorado. 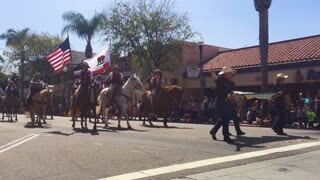 Cowboys on horseback ride through a small town during a 4th of July parade. Bidders buy wild horses at an auction. Longhorn Cattle in the National Western Stock Show Parade.